Enter the Gungeon is a prime example of how reviewing a game can change over time. 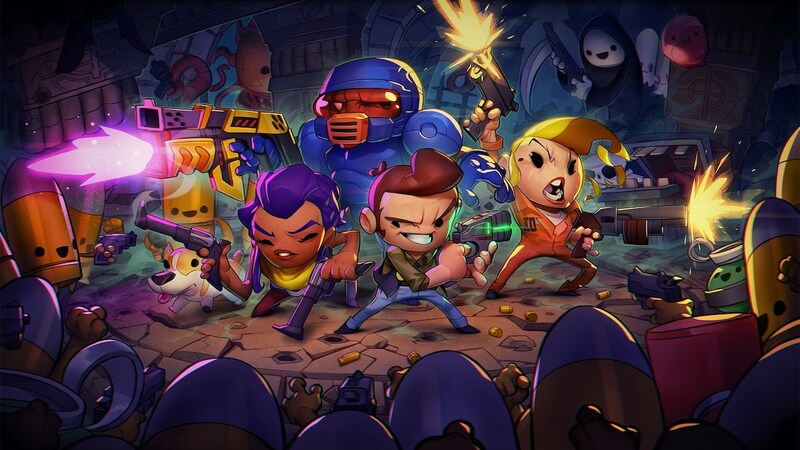 I first reviewed Enter the Gungeon for PC on another website – the game has been out for a long time now, so a lot of people know what the game offers – making writing about it a little harder as I want to offer something fresh. It’s a pseudo top-down roguelike shooter that grounds itself in features set out by The Binding of Isaac and Nuclear Throne. The base game has received many updates and has been featured on YouTube and Twitch for quite some time. So, there’s not really much that I can say about the game that’s new. This is a direct transfer of the latest PC release, including the new updates from the Supply Drop patch – which introduced new items, features and enemies. The game itself plays the same way on Switch that it does on other systems (with one difference I will come to), however, it does feel a little easier than it has previously. Dodging enemy fire with the dodgeroll system is still tight, the weapons are still very hit and miss depending on what you pick up and the enemies can still be bothersome. But, there feels like there’s a little leeway in the speed of bullet momentum and the enemies aren’t quite as accurate. This might be because of the elastic approach to updating a game on PC – things change often and I’m sure a future patch will tweak some of these aspects. Enter the Gungeon doesn’t just take cues from roguelikes that came before; yes, there’s a huge focus on repeated play that allows you to unlock new items and guns and it features the difficulty that usually accompanies such a game. For example, it took me about an hour to finish The Binding of Isaac for the first time; it was easily around 40 hours before I watched the credits roll here. Because Enter the Gungeon is a bullet hell shooter and accuracy with movement as well as shooting is key. And, of course, like all roguelikes, it depends on the build of your character. There are a few base characters to choose from; The Pilot, The Convict, The Hunter and The Marine – plus a couple to unlock, who change the game drastically. Each offers a different starting weapon and item that offers perks throughout play. The Hunter has a pistol and crossbow, but also a dog that will occasionally dig up keys, ammo and blanks, the latter is used to help clear rooms of bullets for a brief breather. The Pilot comes with a laser pistol, discounts in the shops and a lockpick that offers chances of opening a chest without a key. Add to this the hundreds of combinations of guns and perks unlocked along the way and the game becomes incredibly versatile. On one run you might not find anything of any worth in chests or shops, meaning that you’ll face off against a boss with just a starting weapon of low damage. On the flip-side, you could have a run that sees you running at a boss with an RPG, a Shotgun shell that fires guns or the ability to fly while wielding a rifle that fires magical bullets of ice, fire and poison. There might be a run where guns come up short, but defensive items are plenty. You might get to the third floor boss or right to the final boss, an enormous dragun that puts the term ‘bullet hell to the test’. And there’s SO MUCH to do. New shops unlock as you discover people in the Gungeons. Challenge modes open up, boss rush rooms appear and secret routes make themselves available as you play. As with so many games of this ilk, no run is ever the same and players will be constantly striving for that perfect build that clicks and allows the game to be vanquished and the past to be erased – which is the primary aim of the title. Of course, this is the Switch version and that comes with a few small differences to other systems. While docked, the Switch version of Enter the Gungeon is virtually identical to the other console outings, but there’s the handheld mode which shines wonderfully with the same eye-popping visuals, pleasing controls and it lends itself very well to bitesize moments of Gungeon exploring. Then we have to address the fact that the Switch opens up more possibilities for co-op play with a friend. And this is where I reel back to that “one difference” I mentioned above. Because the console has two Joy-Con it allows for easy access to playing couch, coffee shop, park bench co-op, but, of course, the Joy-Con only features ONE analogue stick. This is where the developer swoops in with something that, in their usual fashion, is both ingenious and barking mad… motion control aiming. And this perhaps hints at why the game feels a little easier here; because in this mode, you need to twist and turn in order to take out enemies. It’s not an unpleasant control scheme, but it does leave you wishing for more control and precision in a game that cries out for it, eighty percent of the time. It’s an unmissable game that truly feels at home here. And whether you’re playing for the first time or the 896th, it feels exciting, fresh and unique. Enter the Gungeon has always been a game that you must play, now, on the Switch, it’s a game you must OWN.